Happy Fall! I am thrilled to kick off fall decorating with a inspiring Blog Hop! There are some AMAZING fall-themed project and recipes. Then tomorrow, we’ll do a GIVEAWAY! More on the Blog Hop below. But first… it’s pumpkin time. This is a super easy two part project. 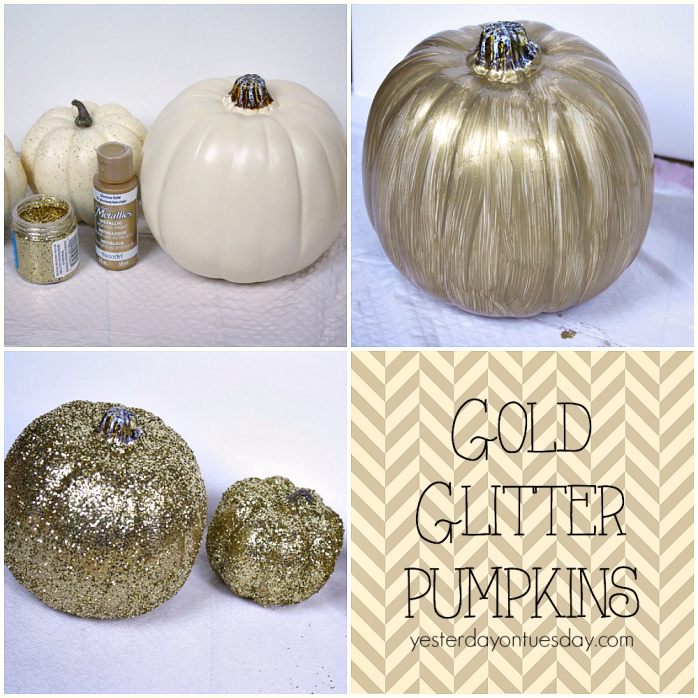 Supplies: To make the glittered pumpkins, you’ll need plastic pumpkins, gold paint (I uses DecoArt Metallic) and glitter. Directions: Simply paint the pumpkin gold (allowing them time to dry) then apply a final coat of paint and sprinkle gold glitter. And then… the burlap! The small pumpkins needed a little something extra to rest on. Burlap to the rescue! Supplies: To make the burlap “bow” you’ll need burlap ribbon, faux leaves and either a string of burlap or metal wire. You’ll also need hot glue. Directions: Cut a 24 inch piece of ribbon and fold it in thirds. Gently tear off a string of burlap or snip a piece of metal wire and tie it around the center of the ribbon. 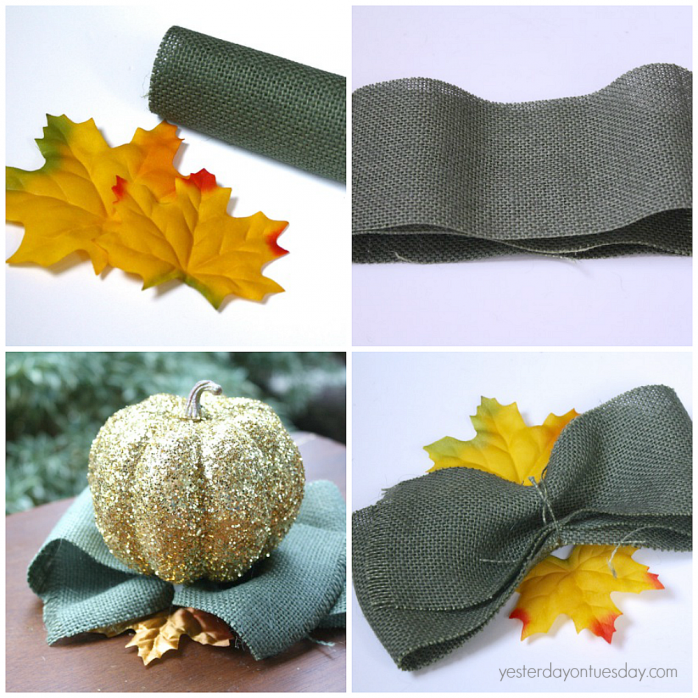 Flip it over and use hot glue to attach leaves to opposite sides of the bow. Glue a small glittered pumpkin to the burlap to finish the project. Yay for Fall! Now onto the blog hop. 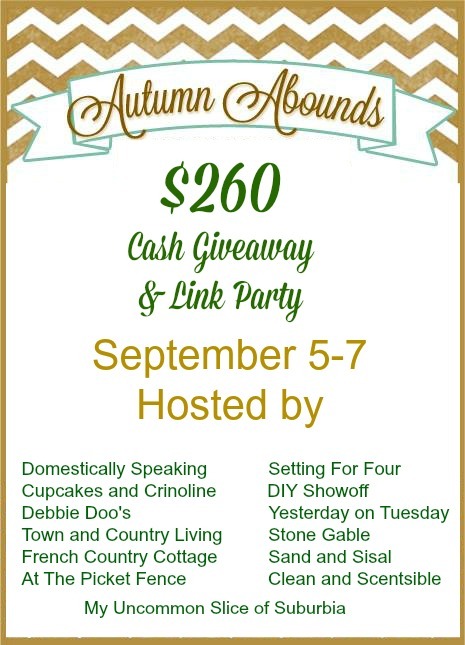 Come back tomorrow for a GIVEAWAY and LINKY PARTY! Thanks Heather! Always a blast partying with you! Malia, you are a girl after my own heart! If you don’t like it… upscale it!!! And you sure did!!! 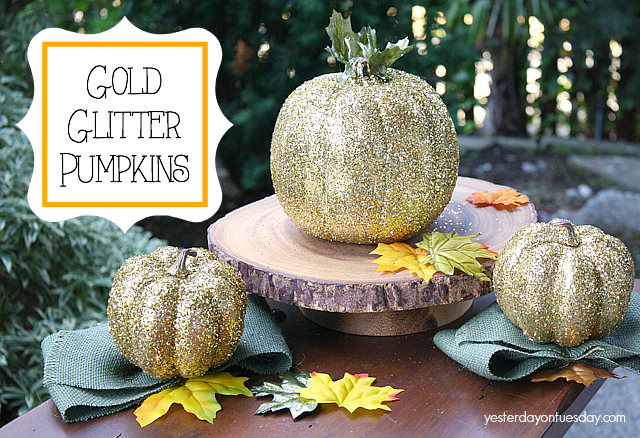 What a fabulous and easy way to make gorgeous, sparkly pumpkins! And I love easy… and this diy is easy-peasy!!!! I’ll be making a few of these fun glittery pumpkins this fall! So fun to party with you! Pinning and featuring you on my FB page! Thanks Kristin… hope you have a great Sunday! These are so super cute!! I can’t wait till Fall. I love them!! Aww thank you Crystal. Have you started decorating yet? Cute, cute pumpkins!! Pinning this! Those are super duper COOL! Love them. Malia these are just so fun! Loving the bling and they look fabulous! Thanks Jillian. Love your blog! Love the glittered pumpkins! Beautiful! Malia I love how textured that glitter is… so gorgeous! Cute! Two of my favorite things–fall and glitter! I’d love for you to share this at my weekly link party http://www.thelifeofjenniferdawn.com/2014/09/a-little-bird-told-me-link-party-107.html Hope to see you there!